Bodhgaya, Bihar, India – Once again the teaching ground had yet to fill when His Holiness the Dalai Lama arrived this morning. After greeting those who had already arrived, he sat down opposite the mandala pavilion. While he was conducting his preparations for the Solitary Hero Vajrabhairava Empowerment, the morning sun shining through an upper window illuminated the Namchu Wangden, the Kalachakra mantra monogram, on the back of the throne. 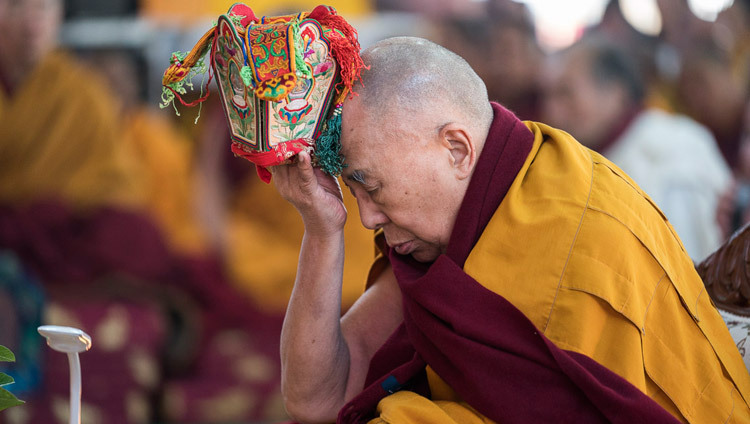 Following the recitation of the customary verses of homage, followed by the ‘Foundation of all Excellence’, His Holiness declared that today marked the end of a series of teachings he has been giving here in Bodhgaya. He acknowledged Mrs Kelsang Taklha, who served the Central Tibetan Administration in several capacities, including Kalon, as the main sponsor of today’s empowerment. He announced that from tomorrow for two days he would be teaching the ‘Diamond Cutter Sutra’, also known as the Perfection of Wisdom Sutra in 300 verses, principally to Chinese students. He observed that since there is no explanatory transmission of this text, any explanation he gave would be his own. Yongzin Yeshe Gyaltsen, tutor to the Eighth Dalai Lama, set a precedent for this with his explanatory reading of the ‘Perfection of Wisdom in 8000 Verses’. “Today, I’ll be giving the Solitary Hero Vajrabhairava empowerment. Those of you who take it will be committed to reading the sadhana and would do well to memorize the long mantra of the ten wrathful deities. As I mentioned the other day, a unique feature of this practice is that it combines the peaceful and wrathful practices of Manjushri. The main goal is to achieve wisdom and Manjushri is the embodiment of that quality. To overcome suffering we have to overcome ignorance and the only way to do that is to cultivate wisdom. This is what the Buddha taught. His Holiness observed that it was as Je Tsongkhapa’s experience of calm abiding and special insight strengthened that he had a vision of this aspect of Manjushri—Vajrabhairava. He further remarked that if you practice the yoga of sleep, you can manifest the mind of clear light. With that, he began to give the empowerment. When everything was complete, His Holiness declared how fortunate he felt to have been able to give these two Vajrabhairava empowerments here at this time. 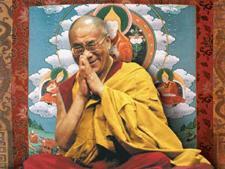 He beamed and waved to the crowd as he left the stage to return to the Tibetan Monastery, Ganden Phelgyeling.